The final volume of the Gemmell Morningstar Award-shortlisted Swords and Fire fantasy trilogy, in which political scion Amalia and her bound fire warlock Zaira must save the Empire from a ruthless, magical enemy. Perfect for fans of Tamora Pierce, The Queen of the Tearling, and Uprooted. While winter snows keep the Witch Lord Ruven's invading armies at bay, Lady Amalia Cornaro and the fire warlock Zaira attempt to change the fate of mages in the Raverran Empire forever, earning the enmity of those in power who will do anything to keep all magic under tight imperial control. But in the season of the Serene City's great masquerade, Ruven executes a devastating surprise strike at the heart of the Empire - and at everything Amalia holds most dear. To stand a chance of defeating Ruven, Amalia and Zaira must face their worst nightmares, expose their deepest secrets, and unleash Zaira's most devastating fire. Melissa Caruso was born on the summer solstice and went to school in an old mansion with a secret door, but despite this auspicious beginning has yet to develop any known superpowers. Melissa has spent her whole life creating imaginary worlds, and in addition to writing is also an avid LARPer and tabletop gamer. She graduated with honors in Creative Writing from Brown University and has an MFA in Fiction from the University of Massachusetts Amherst. 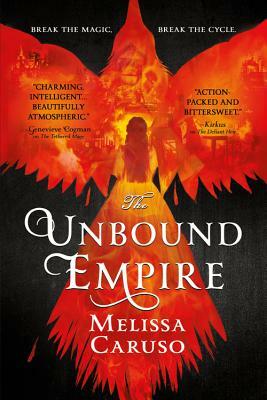 Melissa's first novel, The Tethered Mage, was shortlisted for a Gemmell Morningstar award for best fantasy debut. "Charming, intelligent, fast-moving, beautifully atmospheric, with a heroine and other characters whom I really liked as people. (I overstayed my lunch break in order to finish it.) I would love to read more set in this world." "Breathtaking... Worth every moment and every page, and should make anyone paying attention excited about what Caruso will write next."